These guys are back. We noticed them a year or so ago, and for a while thought this was another South American pirate, but it seems to be outbanders of some sort. The transmissions are on roughly 6964 AM, I say roughly because some of the transmitters drift a lot, which is quite visible on the waterfall. One in particular is drifting from 6961 kHz when he goes into transmit mode to 6965 kHz after a few minutes. At 0114 I started to get someone else on 6965.5 LSB. He appeared between breaks in the AM transmissions, so I think he was part of the net. Looks like they closed up around 0124. 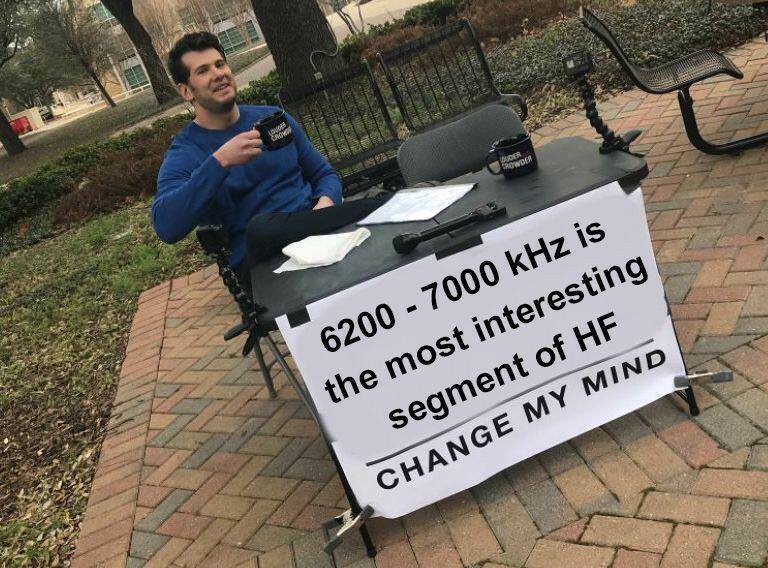 Another reason why 6200-7000 kHz really is one of the more interesting parts of HF. Another bump in the night from Latin America. 6200-7000 kHz is full of these guys on a busy night...all over the bands in USB/LSB and AM apparently.